The four founders of EthiCS (JOSH WAGNER/The Stanford Daily). Efforts to use computer science (CS) to solve societal problems have proliferated in recent years, but not all agree that CS is the best avenue to affect change. 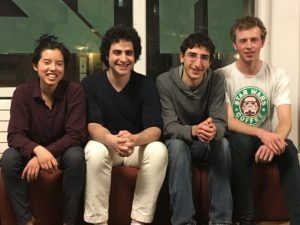 Noah Arthurs ’18, Sawyer Birnbaum ’18, Nick Pether ’18 and Sonja Johnson-Yu ’18 are questioning whether CS should be used at all in creating social change through their new group, EthiCS. The four founders of EthiCS (Courtesy of Farhan Kathawala). EthiCS will hold its first open meeting on Mar. 1, in which students from all majors will have a space to voice their concerns about the ethics of CS and decide the core issues that the group will focus on in the future. Each of the founders is interested in exploring a particular dilemma related to CS. Arthurs, for example, hopes to tackle the relationship between technology and policy, particularly policies that regulate how corporations share consumers’ personal data. Like Arthurs, Johnson-Yu is interested in the negative impact that tech companies may have on underserved areas. In the Bay Area, gentrification has increased rent for nonprofit charities and the communities they serve, forcing residents to relocate. Collectively, the founders hope to open up a dialogue among students about ethical quandaries relating to CS. In the coming weeks, the group will begin to meet officially and determine how to devote its resources and time. Although many student groups on campus already deal with humanitarian aspects of CS, such as CS + Social Good, EthiCS is different in that it questions whether or not CS should be used to address social inequalities in the first place. “People say that technology in the past has created more jobs than it destroyed, so the conversation ends right there,” Birnbaum said. Some of the questions that the co-founders are grappling with include what software engineers at Palantir should do if asked to compile a list of Muslim users and whether genomic alterations transform the very nature of what it means to be human. Political science Professor Rob Reich, who serves as faculty director of the Stanford Center for Ethics and Society, said he was heartened by groups like EthiCS that seek to grapple with the human aspect of technology. “If it’s anything like CS + Social Good, it’s just a welcome sign about how Stanford can combine a liberal arts education with a skill-based education,” said Reich. Conversations like these are not restricted to the Stanford community. In early February, prominent artificial intelligence pioneers such as Elon Musk and Stephen Hawking endorsed a list of 23 principles, priorities and precautions that should guide the safe development of ethical artificial intelligence technologies. Founders hope that the group will ultimately be shaped by students and the areas they care about. Some potential ideas for action include inviting speakers onto campus, lobbying the university to create a class cross-listed in both philosophy and CS and working with companies in Silicon Valley to bring these issues to light. According to Reich, ethical questions in CS are at an all-time high, particularly because of the high-paying career paths students may choose immediately after graduation. “Many students are treating Stanford University as a conveyor belt to technology wealth,” Reich said. Like Reich, Birnbaum was concerned that some undergraduates never get the chance to engage with the impact of their craft on society while at Stanford. “Right now it’s pretty easy to complete a CS major without taking any classes that involve these kinds of ethical questions,” Birnbaum said. Group founders hope that EthiCS will provide a space for students to think critically about their future careers and the relationship between CS and societal issues.